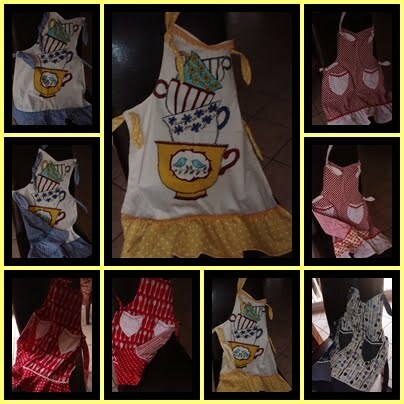 Since the SECET fundraiser I have been busy making more aprons as commissions for friends. These are still as a fundraiser for SECET and if time allows I will continue to make them. I was given a big bundle of fabrics from one of my FB friends to use so have no excuse now. Hoping to cut a heap out and just sew one every now and then so I will have a stockpile for the next fundraiser - i think theres one in April. At the moment I am still in the hexagon & framed hexagon swap - may leave it for a month as December is just too busy, if this weeks roster is anything to go by , I have been rostered on for 6 days straight, they may only be part days but is been a long time since I have worked anymore that 3 days in a row. Anyway back to the hexys- the framed one is for Natalie and the flowers is for Vicki, they should both receive them in the next few days. I loved making both of these as these are so my colours and have used some of my favourite fabrics in both of them. Wonderful aprons. Lucky friends :). They will sell themselves at the fundraiser!